Summit is the first Travel Clinic to offer Virtual Travel Health Consultations, where our patients can meet with a Nurse Practitioner in the convenience of their home. Summit Travel Health is an innovator in the Travel Medicine space: our technology allows you to do a full travel consultation and itinerary review in the comfort of your home or office. We understand that people have busy lives, so we wanted to build a convenient solution that allows you to speak directly with our Nurse Practitioners about your travel plans. We received many requests for this functionality from our busy patients, and we are excited to now it offer it. Our Virtual Travel Medicine Consultations Cost $30, and the consult fee will give you the ability to come in to meet with our Nurse Practitioner for free to receive any recommended travel vaccinations or travel medicine prescriptions. Vaccines and medications are separate and will be billed at the time of administration. Utilizing our technology platform, you can securely meet with one of our Nurse Practitioners over video and discuss your medical history and your travel itinerary. Think of this as having a Google Hangout or FaceTime with our Medical Staff, where you can ask any relevant questions about your travel itinerary or specific vaccines. Our Nurse Practitioners are experts in travel health and vaccine preventable diseases. We will help you prepare for a healthy and safe trip to any destination. As part of your pre-travel consultation we will advise you of the vaccines or medications available to minimize specific health risks in your area of travel. If during the consultation it is advised that you need a travel vaccine or travel medicine prescription, our Nurse Practitioner will schedule and appointment time in-person where you can come into one of our ten clinics and receive your vaccines in a timely manner. Schedule a virtual travel consult. Fill out the medical forms we provide. Complete your virtual travel consult with our Nurse Practitioner (15 minutes). If necessary, our Nurse Practitioner will then book a follow-up appointment in-person, where you can meet at one of our ten locations for vaccine administration (15-30 minutes). These are common questions from many of our international travellers that we can use technology to answer. Our mission is to help travellers see the world, safely so they can enjoy their destination and return home energized by their new life experiences. Summit Travel Health consultations are designed to educate travellers on any destination specific health risks and help them understand any travel vaccines that may be currently recommended by the CDC or Canadian government. Understanding your vaccination needs before travel is critical to our mission of helping travellers see the world, safely. 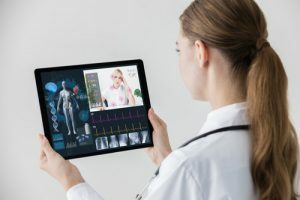 Virtual Travel Medicine was one of the most widely requested functions of our patients, and we hope to increase awareness and access by providing this innovative feature.